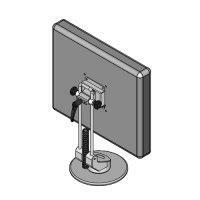 LCD Free Stand(Model #60240F series) - Sallas Industrial Co., Ltd.
Sallas - #60240 series LCD free stand allows flat panel monitors to be moved freely on desk top, yet still offers effortless 360 degree side-to-side rotation, up-and-down, tilt angle adjustment and height adjustment provides a best view position for personalizing usage. Well design space saving stable small swivel base. 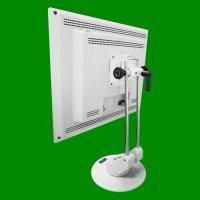 Durable construction for supporting a flat panel monitor. Adjustable monitor tilt adjustment (Tilt range is subject to change because of different sizes of LCD). Portrait/landscape pivot rotation 90 or 360 degrees.